The bagpipes are sometimes described as “an ill wind that nobody blows any good”, but the ill wind that rushed up Tom Walkinshaw’s kilt when the Arrows F1 team went titzup last year is going to blow some people some good. In July, the auctioneers Wyles Hardy are flogging off a few old cars that they found parked out the back of the Arrows workshop. For example, there is Damon Hill’s spare Arrows A18, and a Ligier JS41 show car, there’s an ex-Michael Schumacher 193B, while Jos Verstappen’s 1996 FA 17 is up for grabs in addition to a whole host of other race cars including several Ford Capri’s with the V6 quad cam engines and even a rice burning RX7. So what did we learn from the Monaco GP? I don’t care if it is the most glamorous race on the calendar, has more popsicles with fake tans per square metre than anywhere else and the most expensive boats in the harbour - as a motor racing venue it is dull, dull, dull! Impossible to pass anywhere, so the race is a high speed procession from go to whoa. To hell with history, dump it! Bring back Spa - a real circuit where drivers can actually dice with each other. One thing we learned on the lead up to the qualifying was that if someone drops a bundle of oil, the cars next up for their one lap of guts or glory have got one helluva problem. On the Thursday, when Heinz-Harry Frentzen in the Sauber decided to see if he could detonate an engine, and did so very successfully, the drivers following in their one at a time sequence were all around half a second slower than they had been before as they slithered through the oil and concrete dust. Bit of a shame, but this new qualifying format really is a bit of a gamble. We also learned that it really wasn’t Heinz-Harry’s weekend at all, neatly chopping one corner off his car on the first lap of the race. It wasn’t Jaguar’s weekend either, with both cars stopping in the early stages. Webber’s had an engine air leak, while Jungle Boy Pizzonia’s just didn’t come home. Reason unknown at this stage, but Jaguar personnel would have been spending many nights working their way around these reliability problems before Canada. 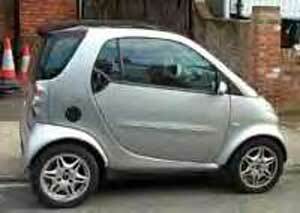 Driving along the other day I spotted a Smart in a used car yard. It was in blue and black, and eye-catching would be a better word for the vehicle. A Smart is certainly not the car for undercover surveillance work. (For those with long memories, remember Maxwell Smart, the TV secret agent? The Smart was definitely not named after him!) For my money, they look great, and have a lot more panache than the family Mira. So will we get the Smart here in suitable numbers? So there you are - right from the top. Don’t hang around the Benz showrooms looking for a slightly soiled Smart. They are not coming here, other than as grey imports. Anyone got a used Peugeot? Or Caveat Emptor! Buying a used car anywhere in the world is always a problem. In Thailand it is even harder. I received this letter the other week from an ex-pat looking for a Peugeot. “Dear Automania, I read the newspaper every week and enjoy your Automania column. I have been here in Chiang Mai for about four months and have been debating whether to buy a car. I have been very uneasy about driving here but am gradually getting used to it. Then there comes the problem of finding a car here. I have visited a number of used car yards but am much more comfortable with buying directly from owners via classified ads. Do you have any tips for used car buyers here? What about people who may only be staying a year or two? Are there any lease or buy back schemes. This might be a useful topic for your column. I have noticed a couple of Peugeot 504 Dual Cab pickups here in Chiang Mai. They are very unusual in Australia (my home) and as a Peugeot and French car lover, I would love to buy one of these if I am going to buy any car. How do I find a car like this to buy? What do you think of the possibility of shipping it home in about 18 months time, and reselling it as an oddity in Australia, in an attempt to recover my purchase and shipping costs. Does this sound like a reasonable proposition to you? I thank you in advance for your time in responding to my questions. Well Hugh, if you don’t know enough about cars to spot the dogs in the car yard, it is a case of getting someone who does know to look at the vehicle. A couple of thousand baht spent with the workshop people to get them to look any car over is always money well spent. As far as shipping it out of Thailand and selling it in Oz as an oddity - forget it, Mate! The Aussie car market doesn’t buy ‘orphans’ and never has. They’d be worth next to nothing, but ask someone in Australia to look up Peugeots in Glass’ Guide to Used Car Prices, to confirm this. Lease-back schemes with a guaranteed buy-back figure are generally only for new cars. Happy hunting. The travelling Eff Wun circus has travelled across the pond to the Gilles Villeneuve Circuit in Canada for this weekend’s round. This is an interesting and challenging circuit, at which more than one ex-champion has found a wall waiting for him. In the past, the Canadian GP’s were held at Mosport Park, but in 1978 the new circuit was constructed on a man-made island which had been used in the 1967 Expo. Originally named the Ile Notre Dame circuit, the location is one of the loveliest in Formula One with the narrow track threading its way through lakes and parkland. 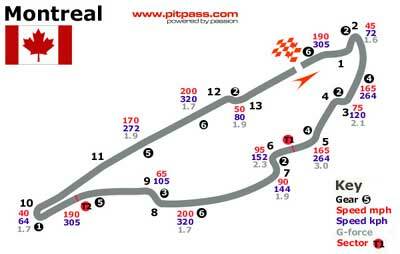 It is a narrow, medium-fast, 4.4 km circuit with 13 corners which has changed only in minor detail since being built. A new corner before the pits was added in 1991 and a chicane was added in 1994. The circuit was named in memory of Gilles Villeneuve (Jacques’ father) who was killed in 1982. How quick are the current bunch of F1 drivers? To begin with, let’s say that this year all of them are quick (unlike previous years when one driver couldn’t make the 107% cut off and even had to be replaced for a couple of races as he was too slow). However, some are definitely quicker than others, and the litmus test is whether the driver is quicker or slower than his team mate. The Minardi’s might be dogs of motor cars, for example, but both the drivers get a puppy! The following table I gleaned from www.pitpass.com and it shows the average difference in qualifying times between the two drivers in each team. The faster driver is mentioned first. In F1 terms, quarter of a second is a long way. At a circuit where the cars are averaging 160 kph, the quarter of a second slower driver is losing around 15 metres every lap. That is equivalent to being one km behind at the end of the race. Now look at the table and have a gander at the eight drivers who are over 0.24 seconds slower on average - Villeneuve, Coulthard, Frentzen, Wilson, da Matta, Pizzonia, Firman and Alonso. What is the future holding for those guys? For my money, Villeneuve, Coulthard and Frentzen have all passed their use-by date. All good drivers, but both getting on in years (in F1 terms) and won’t get quicker - just the reverse. Wilson and da Matta are new to F1, but will have to improve if they are going to keep an F1 seat in 2004. Pizzonia is already under a cloud, but having the talent of Webber in the same team must be undermining his confidence, but I say he’s a doubtful for 2004 as well. Firman is just not making the grade and so it will be goodnight nurse for him too at the end of the year (unless he comes up with another huge swag of gold to give to Eddie Jordan). The final one is Alonso. The young Spaniard has been on the podium this year, but seems very erratic in qualifying. He’ll still be there next year, despite his ups and downs. The oracle has spoken! Last week I mentioned that wings are now commonplace in race cars of all categories, and the company that started the craze with wings, as we know them today, was American. This company had really begun developing and refining an idea that had been used over a decade previously, but not used as an aerodynamic aid for cornering. What I wanted to know was what was the item that was the forerunner of the wings, and what was it used for - and on what cars? The answers were the American company Chapparal with the movable flap at the back of the car that was used as air-brakes, but the Mercedes 300 SLR in the mid fifties had this many years before. So to this week. And it is certainly difficult to stump some of you. MacAlan Thompson has the most incredible web-crawling spider out there! Right, here we go - the leaping cat is the bonnet mascot associated with the Jaguar marque, but another make used the leaping cat mascot in 1954. Clue - it was American. What was this car?